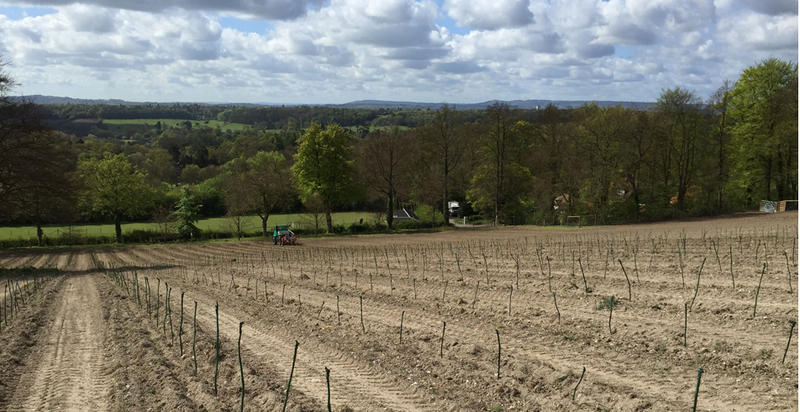 Nine thousands new vines have been planted by Greyfriars Vineyard in Surrey as the company aims to boost its sparkling wine production. The firm, whose vineyards are located in the Guildford area, finished planting at the end of last month (April, 2015) and has now increased its total number of vines to 70,000. Greyfriars’ investment in new plantings reflects the UK’s recent growth in wine production. Figures released this week (May 11, 2015) by the marketing body English Wine Producers (EWP) show that the 2014 harvest broke all industry production records. A total of 47,433 hectolitres were produced last year – the equivalent of 6.3 million bottles (75cl). This represents an increase of 42 per cent in volume over 2013. EWP and United Kingdom Vineyards Association (UKVA) also revealed that, according to estimates, at least two-thirds of English production is now sparkling wine. He added that the firm has also planted a small amount of Pinot Gris and some early-ripening Pinot Noir, to give the firm “some more diversification.” Wagstaff said: “We are about to release our first still Pinot Gris.” He added that the company also grows some Sauvignon Blanc and has made both still and sparkling Sauvignon Blanc wine in small quantities.